To say that the UCSD women’s volleyball team had a rough weekend is a bit of an understatement. Headed into the weekend 12–10, the Tritons had just dropped yet another five-set match and were hoping to turn their fortune around in their Friday night match against Chico State, a team they hadn’t lost to since 2014. Unfortunately, that streak came to an end with a thrashing 0–3 loss, a nightmare that would recur on Saturday night against Cal State Stanislaus in another 0–3 loss. While the first set was a fairly close affair, the Wildcats took the lead early and never relinquished it. 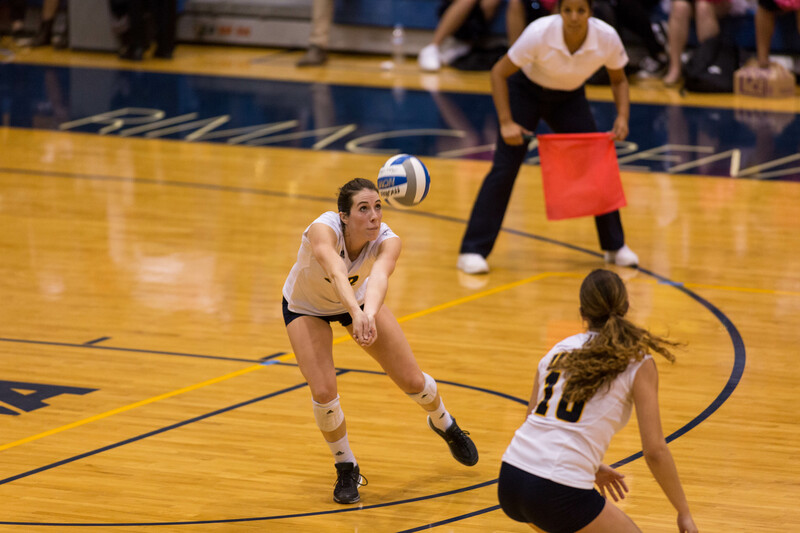 Despite a kill by junior outside hitter Amanda Colla to give the Tritons a 3–1 lead, a Chico State kill and two UCSD attack errors gave the Wildcats a 4–3 lead, a lead built by three UCSD errors. The Wildcats gladly took this opportunity, pushing their lead to as many as six points halfway through the set. While the Tritons made it a competitive 20–22 off of a kill by junior middle blocker Rebecca Seaberry, they ultimately fell 25–21. The second set was a nailbiter in all regards. After starting off 3–1 yet again, the Wildcats fought the Tritons tooth and nail, closing in to tie the game every time it seemed like the Tritons were pulling ahead. In a set marked by seven lead changes and 15 tied scores, it seemed destined that the two teams would play for extra points. Failing to capitalize on opportunities to put the game away while leading 25–24 and 30–29, the Tritons would concede three straight points, culminating in a service ace, to drop the set 32–30. The third and final set of the night was yet another fairly close game. With nine tied scores and four lead changes, the set looked like it could go either way or perhaps go into extra points again. However, after senior middle blocker Meagan Wright brought the team within one to make the game 17–16, the team simply fell apart. The Tritons then gave up a kill, an ace and then committed two attack errors, allowing Chico State to pull ahead for good and eventually close out the night with a 25–19 victory over UCSD. Freshman outside hitter Jessyca Beksa was the only UCSD player with at least 10 points, although freshman opposite Simone Froley, Colla and Wright all came within a point or fewer. Despite Colla leading the team with 15 digs and sophomore libero Kayla Evans’ 31 assists, it was simply not the Tritons’ night. The first set of the Tritons’ Saturday night matchup wound up being yet another close game, but unfortunately it also ended up being the team’s closest set of the night. For the majority of the match, neither team could gain any momentum; each point was matched by the opposing team. Things began to slip away slowly for the Tritons, however, as the Warriors’ lead slowly grew until finally knocking out UCSD for a 25–21 victory. With the final two sets, UCSD’s night began to tumble. The Warriors stayed just far enough ahead of the Tritons in the second set to keep the game competitive without giving the Tritons any actual opportunities to come back. A Wright kill gave the Tritons a brief 7–6 lead, but the Warriors responded with a five-point scoring run to take the lead for good and eventually take the set 25–17. The Tritons actually showed some flashes of life in the third set, starting out with a 9–4 lead, but that lead quickly crumbled with the help of three UCSD attack errors. With the Tritons’ confidence crushed, Cal State Stanislaus steamrolled the rest of the set with an anticlimactic 25–16 win to continue the Triton nightmare. With the win, Cal State Stanislaus improved to 11–14 overall and 8–8 in conference, while the Tritons fell to 12–12 overall and 8–7 in conference after the back-to-back losses. The Tritons get an opportunity to turn things around in their final regular-season match of the season, where they will travel to Cal State San Marcos on Saturday, Nov. 12.